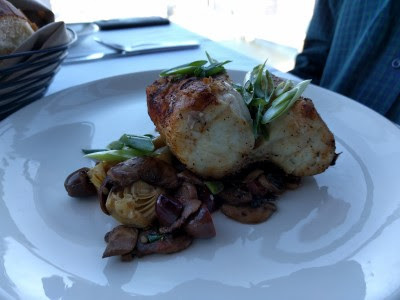 This past weekend we went out for our anniversary dinner celebration. 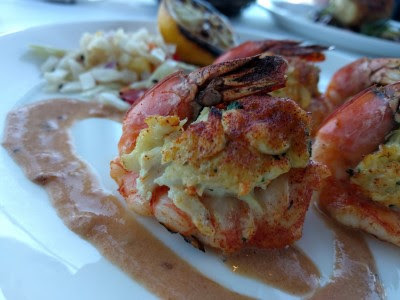 Once again, we chose Monterey Bay Fish Grotto on Mt. Washington. We made our reservation for 5 pm in hopes of getting a table next to the window. Happily, we did, a table in the corner with a terrific view. 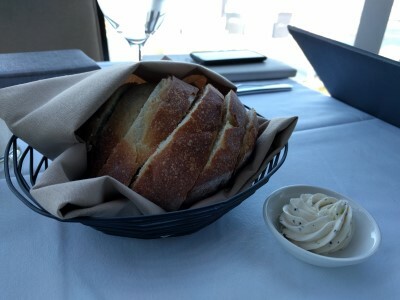 Bread with herb butter. Good bread, but we both tried to control ourselves and save room for the food to come. 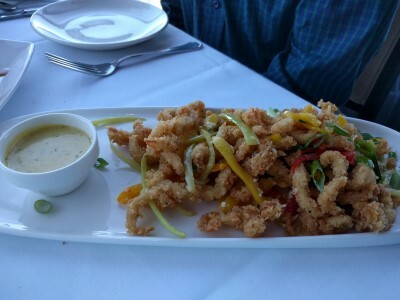 Appetizer #1: Calamari (lightly fried, scallions, red & yellow peppers, mango cilantro sauce). We really enjoyed this a year ago and it was just as delicious this time. I didn't dip my calamari in the sauce because I dislike cilantro, but SP liked the sauce a lot. 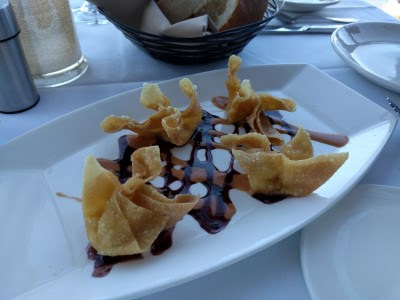 Appetizer #2: Lobster Rangoons (sweet Maine lobster, cream cheese, chives, lobster thermidor sauce). I don't think that was lobster thermidor sauce but it was still good. Definitely a good rangoon. 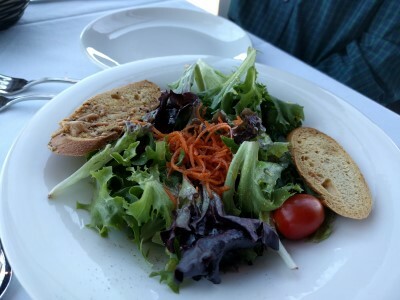 We shared a House Salad (mixed artisan greens, heirloom tear drop tomatoes, carrots, crostini, passion fruit vinaigrette). I like the dressing a lot. 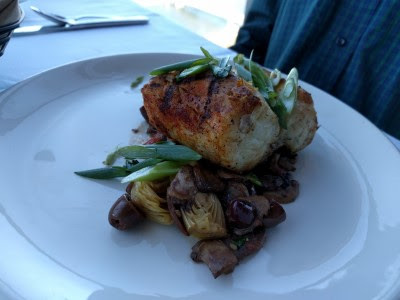 SP's entree: Striped Bass, Monterey Style (chargrilled with artichoke, black olives, tomato, onion & mushrooms sautéed in marsala wine sauce. Another view of his striped bass. He really enjoyed his fish and the vegetables/sauce. 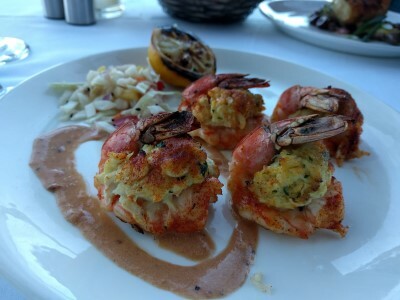 My entree, the same as our last visit: Jumbo Shrimp (stuffed with signature crab cake, Lobster Thermidor sauce). These were as tasty as I remember. The shrimp were nicely cooked but it was the crab that I kept wanting more of because it was so tasty. 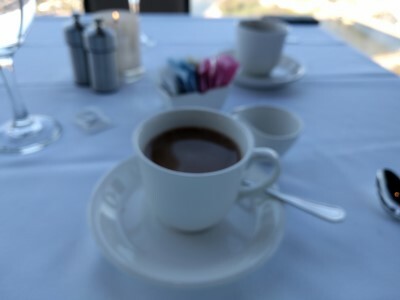 We don't alwyas order coffee after dinner, usually only when we're celebrating & relaxing. We both got decaf. We decided to share 2 desserts. Since we were so full, we ended up not sharing and each took home a bot of our dessert for the next night. 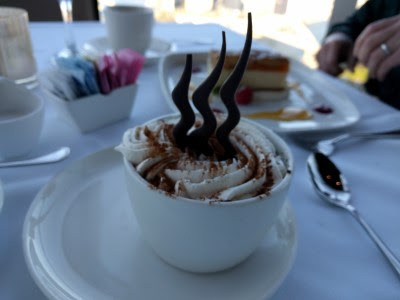 Above, for SP, Peach Cobbler Cheesecake (peach cobbler, vanilla cheesecake, graham cracker crust, Chantilly cream, peach coulis) and below, for me, Steaming Chocolate Latte (warm flourless chocolate cake, Chantilly crème, chocolate steam, cinnamon dust). 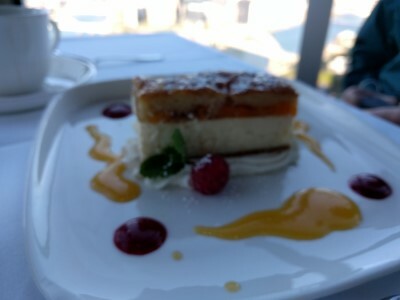 I loved the presentation of my dessert. The chocolate steam rising from the cream dusted with lots of cinnamon and underneath, the warm, rich chocolate cake. One of my favorite desserts. SP liked his dessert a lot, too. We both still like MBFG a lot. 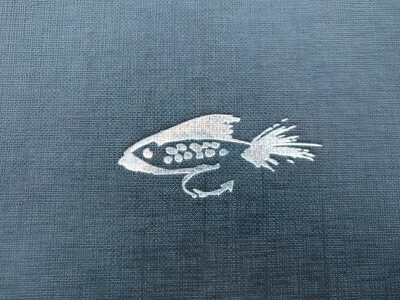 The food is tasty and our server was attentive and friendly. We did each have a glass of wine, a sauvignon blanc for me and an unoaked chardonnay for SP, which I forgot to photograph. 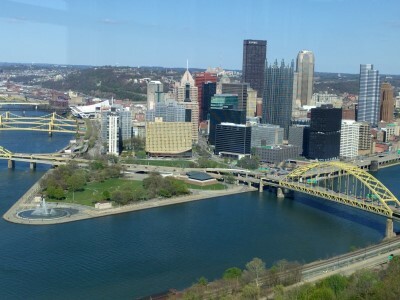 The views are terrific from just about anywhere, but we were happy and lucky to have a table right next to a window. As I said before, it's pricey and so a special celebration place for us, but it's a worthwhile dinner splurge.